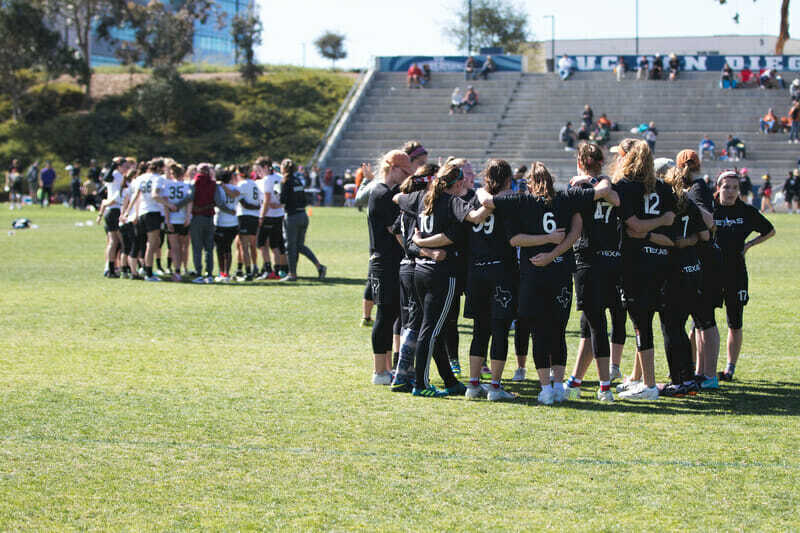 Coverage of D-I women’s regionals is presented by VC Ultimate as part of their season-long support of our women’s coverage. All opinions are those of the authors. Please support the brands that make Ultiworld possible and shop at VC Ultimate! We thought the excitement of South Central Regionals would be reserved for the final, the climactic extension of the rivalry between #7 Texas Melee and #14 Colorado Kali. The duo had matched up seven times in three seasons: five double game points, one game decided by more than two, two elimination games at Nationals (including their 2017 semifinal), and two straight Regional finals. And while the final will have its place in that story, it wasn’t the only close and important game to take place. In the final, the first half belonged to Melee. Texas, jumped out to a 3-0 lead, which they held into the halftime break. The Austin club pounced on Colorado’s mistakes and were more efficient in the windy conditions. High release breaks throws from Domenica Sutherland and strong play from Anna Hutton helped Texas navigate the different looks Colorado tried. From 8-5, however, Colorado found the energy that has characterized their squad over the past few years. They closed the gap, scoring twice in a row to make it 11-10, but were running out of time with the soft cap already on. With Texas up 11-10, the hard cap horn went off, necessitating a Kali score, but it was Melee who found the end zone. Texas reclaimed the South Central Championship after back to back years of losing to Colorado in the final on double game point. Waiting for Colorado in the game to go was Washington University. Fresh off of three straight victories with three goal margins, Wash U started the game in an 2-0 hole. But with Colorado up 4-2, Iron Horse went on a 6-1 run, powered by the disc handling of Rachel Stockdale and Miranda Niel, to take half 8-5. For the second straight game, Kali would need to find their way back from a three goal halftime deficit. In the second half, Colorado started varying their defensive looks, throwing out zones and person defense, looking for any way to slow the game down and wear down Wash U. It was Wash U’s fourth game of the day and eight of the weekend, while Colorado had played far fewer points over the course of the tournament. While Iron Horse fatigued, Kali picked up, riding Kelsey Bennett and Jean Russell’s ability to keep the disc alive in the wind and inspired play from freshman Saioa Lostra to fight through long points and pile up breaks. After the teams traded two points to make it 9-6, Wash U did not score again. Led by the determination of ace defender Emma Capra and Jessie Chestnut, Colorado went on a 5-0 run to close the game 11-9, a heartbreaking result for Wash U and a triumphant one for Colorado. “We get one more month together!” joyously declared Colorado senior Megan Henderson through tears. Their car rides back to Boulder would be filled with exhalations of relief and the unnerving realization that they almost missed out on Nationals altogether. More importantly to them, however, will be the lessons learned. And the extra weeks to build from them. Comments on "Texas Victorious While Colorado Survives Scare (South Central D-I Women’s Regional Recap)"